Join the discussion on our forums! 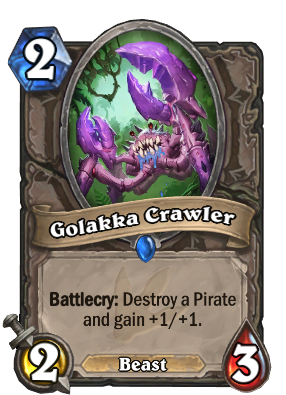 Come discuss Golakka Crawler over in our dedicated Golakka Crawler discussion topic. Power creep on River Crocolisk. They could have made it a 2/2 body and raised the buff to +1/+2 to compensate, it's that simple no need to make a card obsolete. River Crocolisk would need a significant buff to see play anyway, and this doesn't really see play. Battlecry: Eat your own Patches. i hate pirate warrior and never played it but when i destroy Naga Corsair with this card i feel bad for pirate player.it should be like if your opponent controls a pirate gain +1/+1 and taunt. A pirate warrior had this in their hand (for some reason) and I got a copy with Mind Vision. I'm convinced that it single-handedly turned the game around for me. Cards like this that are designed to answer a specific thing aren't supposed to be strong at their base. There's no drawback to putting this card in your deck because a 2/3 beast for 2 is just fine on its own, so this hoses pirates for free. This card is legitimately terrible design, which I guess is what you have to expect from blizzard at this point. Pathetic, honestly. You are completely wrong and your line of thinking is the reason hearthstone has so many dead cards. Hearthstone is based around your winrate over many games. You know what happens when you make a very situational card that is ok in a certain situation but nearly worthless everywhere else? It's never played. I'm not quite sure if that was your intention, but didn't you just describe exactly this card? My Golakka just ate a 9/9 Luckydo Buccaneer. That was a very sad Rogue. "FLY POLLY!" *SHING*BOOM* "I'M IN CHARGE NOW!" Garrosh: Ready for smORC, Rexxar? Rexxar: *plays crab* I smORC you now! Still a solid 2 mana 2/3 body, and when it does work it gets even better.